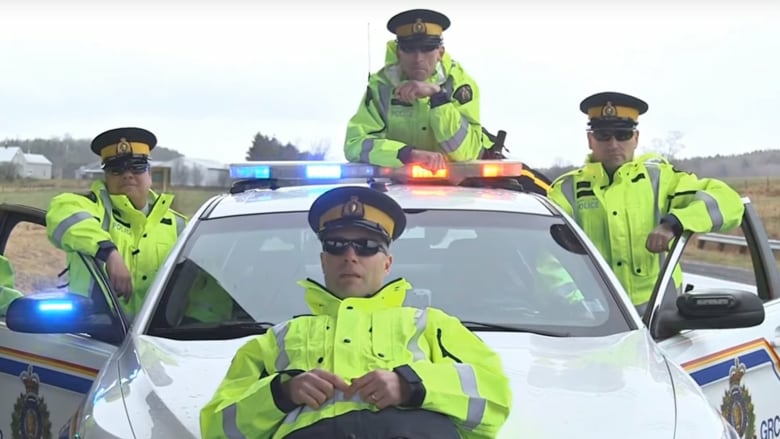 Nova Scotia Mounties have released a video that parodies Drake's drunk-uncle-at-a-wedding dance moves in a bid to remind motorists of the province's Move Over law. Nova Scotia Mounties have released a video that parodies Drake's drunk-uncle-at-a-wedding dance moves in a bid to remind motorists of the province's "Move Over" law. In Cop Light Bling, a handful of RCMP officers cheerfully mimic the Toronto rapper's Hotline Bling video while a uniformed frontman lip-syncs. Cpl. Jennifer Clarke said the spoof song and video were made to remind people of the six-year-old law, which requires drivers to slow down and move into the farthest lane from any emergency vehicle that is stopped with its lights flashing. "It's something that's been brought to our attention by our members on the road, that it seems to be the awareness is not there in the public," said Clarke. "Humour always gets people's attention and we really wanted unorthodox, unique, a memorable way of getting the message out there." Where Drake croons "You used to call me on my cellphone, late night when you need my love," in the chart-topping single, the RCMP "singer" complains, "You sped past my cruiser, you nearly hit my leg!" Clarke said the goal was to use humour to make a serious point, and reaction to the video after it was released Wednesday on Facebook and Twitter has been positive. "Busted a gut laughing," replied a Twitter user after the RCMP tweeted the video Wednesday. "Excellent work on that, 10/10, would watch it again." "I did not know I had to go to other lane. I am guilty of doing this before. Know better now," wrote user Dianne Burbine on the force's Facebook post, which has been shared hundreds of times. "Good way to communicate laws." Clarke — who appears in Cop Light Bling — says she and her co-stars "had a blast" making the video. "We were trying to be goofy, absolutely. We're not professional singers or dancers by any means and we weren't trying to portray that."